Drapery Guidance — JJones Design Co. Growing up, my parents were in the window treatment and interior design field. Drawing on their expertise and going with them to many sites, I've picked up some tips to think about when thinking about drapery for your windows. After working with numerous clients I have noticed some people didn't hang up their drapes properly on their windows and have been asked lots of questions about how to do it. So, I created this guide to help you to learn a couple of basics so that you purchase the appropriate size drapes and rods for your windows. I hope this helps! See the difference? Both windows are same size but each has different curtain panels size. Its partially dependent on the ceiling height for your space. Before you purchase curtain panels, please measure your ceiling height to see which curtain panel size would work best for your window(s). It is okay to have few extra inches on the floor to create an elegant pooling look for your space. If you don't like the idea of having to clean the floor around the curtain panels, collecting dust bunnies, or damaging your drapes with your vacuum, then no worries. Select the size to be just above the floor but please do not have it raised more than one inch above the floor. Doing so throws the look of the windows and drapes off. As you'll see in some of the examples below, some choices for how to setup your drapery is merely decorative; they aren't really functional for privacy or blocking light. In those situations you would still potentially need window treatments such as blinds, shades, or shutters to give you the privacy you want. What about other types of windows than the examples above? There are many different way to hang up the drapery properly on many different types of windows. Let's talk about an arch window first. There are two different ways to hang the drapery on the arch window. You can see the examples below. If you want to show off the details of your arch window and get more natural lighting, I would recommend you to get a shorter curtain rod size and hang up just below the arch. The arch window on the left below won't able to black out the window so you would still need to have window treatments of your choice to give you some privacy. On the right arch window - the drapes are functional for privacy and blocking light. 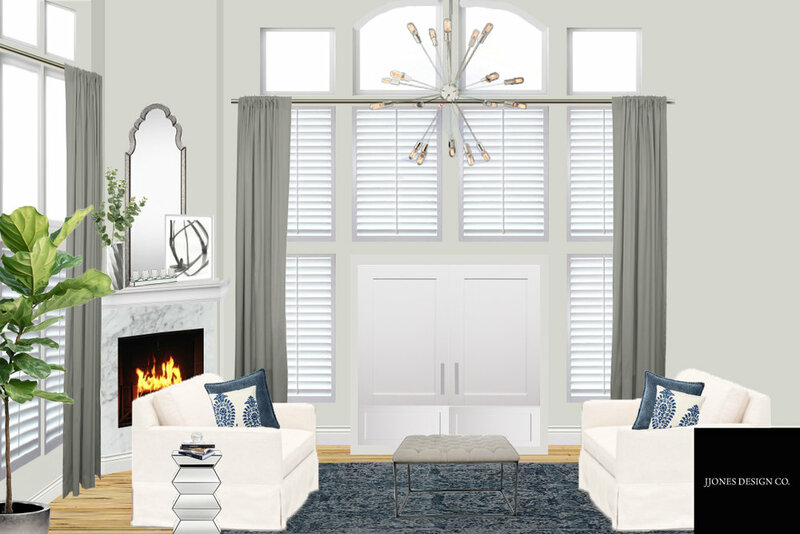 In the past year, I had some e-design clients that have beautiful large expanses of windows and wanted to have drapery on it but weren't sure how to hang it properly. I will share some of my past e-design works that includes large windows that would give you an idea how to hang up drapery properly with different kinds of window configurations. Keep in mind, nearly all windows below already had shades (not shown in pictures) but wanted the addition of drapery to create a more stylish look.